We haven't heard much about Slaughterhouse Rulez since it was first announced last summer. Today, Sony Pictures has released the first trailer and poster along with a surprise release date. The movie is coming to theaters this Halloween. Or at least it is in the U.K. A U.S. release date hasn't been announced yet. In Slaughterhouse Rulez, a giant hole opens up near a boarding school unleashing hell, quite literally. The movie reunites Simon Pegg and Nick Frost, though they've left director Edgar Wright out of the equation this time. The two actors appear in the movie, but it's the young cast that really takes the lead here. And the movie looks like a lot of fun. It's a mix of Shaun of the Dead, Ghostbusters and maybe a little bit of Seth Rogen's This is the End. Sony only provided a very limited synopsis. "School's a bloody nightmare! #SlaughterhouseRulez Only At Cinemas this Halloween." Simon Pegg and Nick Frost have become British icons in their own right. They first worked together in Edgar Wright's seminal sitcom Spaced, but it was the romantic horror comedy Shaun of the Dead that but both on the high road to stardom, especially amongst the nerdy crowd. Shaun of the Dead was also directed by Edgar Wright, and the trio went onto make what is known as Three Flavours Cornetto trilogy, which also includes Hot Fuzz and The World's End. They trio haven't reunited on screen proper yet, but every once in awhile we get another collaboration from part of the team, and this halloween brings Nick Frost and Simon Pegg back together in what definitely looks like a thrilling follow-up to movies like Paul and Attack the Block. Slaughterhouse Rulez comes from rock musician and director Crispian Mills. As we see in the trailer, his intent is to pull a British boarding school into a giant sinkhole that appears behind the establishment. And as we learn from Nick Frost in this sneak peek, it's a direct portal to Hell. We even get to see some big scares and a demon dog. Starring in the movie alongside Frost and Pegg are Asa Butterfield and Finn Cole, who must team up with their teachers to survive. Simon Pegg stars as one of the teachers alongside the great Michael Sheen. Frost is playing a construction worker whose team stumbles upon the giant hell mouth. Crispian Mills co-wrote the screenplay with Henry Fitzherbert. The director previously collaborated with Simon Pegg on A Fantastic Fear of Everything, which didn't get much attention in the states. 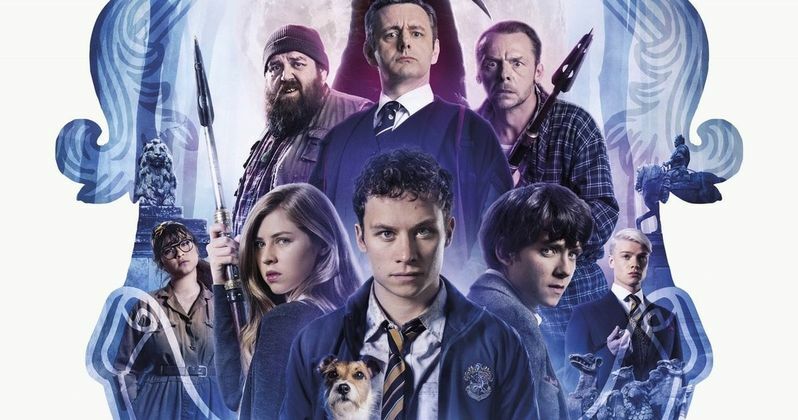 Slaughterhouse Rulez will be unleashing its gore and wicked demons on the world starting October 31, Halloween night, in the United Kingdom. Who knows how long we'll have to wait for this awesome looking comedy horror to hit our shores. But whenever it is, will be too long. You can take a look at the trailer and poster thanks to Sony Pictures UK. But be warned, you're going to want to watch this as soon as this quick clip is over. It looks pretty rad.